JColorChooser in java can be used to select a color from "Swatches", "HSB", "RGB" panels. But only "Swatches" tab has a history of recent used colors. We want to have a global history for selected colors. 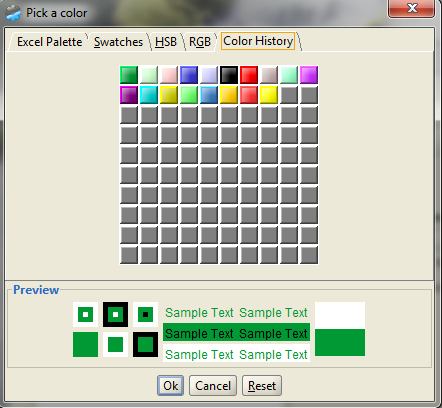 Anytime a color is selected from any tab except "Color History", that color is added to history as the top-left color from the matrix, and all the other colors are moved by a cell to the right. At first glance it does not seem a "big" functionality, but when you think you want to use a number of colors to make your reports and charts look alike, this will help you a lot of time instead of entering again and again the same colors.